Some tech trends fizzle out and die, while others transform our world and how we live. Today, Internet of Everything (IoE) platforms are allowing self-storage owners and operators to reinvent their businesses. Just as broadband and the Internet have been critical enablers of economic growth over the past few decades, IoE is creating new opportunities. Let’s look at smart-connected solutions, their benefits, and how an IoE platform can increase revenue and employee productivity, reduce costs, and enhance the customer experience. IoE is the connection of people, data, process and things. Its primary benefit lies in connecting devices and sharing data between them. This is especially true with a platform that incorporates an analytic decision engine, in which the capabilities can grow exponentially and through which business intelligence starts to take shape. This is much more than a property-management system passing information to your self-storage website or gate system. The ability to connect, collect and act on data is one of the chief advantages of IoE. 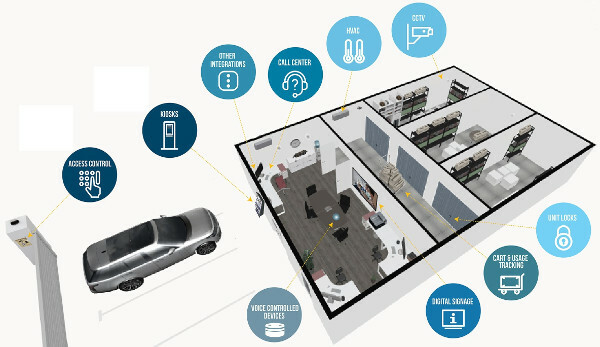 The accompanying illustration showcases many of the solutions that can be connected and analyzed at a self-storage facility. As an example, let’s look at how IoE might work with a facility’s HVAC (heating, ventilation and air-conditioning) system. If you have a climate-controlled building, HVAC is probably one of your biggest monthly expenses. While you can put a timer on a thermostat, you’re probably still heating or cooling the building when no one’s inside, or you have tenants who like to adjust the temperature to meet their desires. By integrating your access-control and HVAC systems into an IoE platform, the platform can use historical information to predict when customers are most likely to be at the property and automatically adjust the temperature. The cost savings could be substantial. Case studies from large facilities have shown that implementing HVAC control can reduce maintenance and energy costs by nearly $100,000 per year. These savings fall to the bottom line, and at today’s capitalization rates, can result in a significant increase in property value. Preventive and predictive maintenance is another area that benefits from IoE. When facility repairs come without warning, they tend to be more expensive and the customer experience suffers. It’s typically cheaper to maintain something properly than to repair a breakage. With sensors attached to smart devices, you can now predict when something should be maintained instead of waiting for a scheduled date. How many of you have had your gate operator break on a Friday, before a long weekend, when you were planning to leave town? With an IoE platform, the number of gate cycles can be monitored and the gate-operator data collected, analyzed and acted upon, notifying you before an issue becomes critical. Turning gate operators, HVAC systems and other devices into smart systems allows you to detect issues before they become a costly repair. Where and how technology can be implemented is helping IoE become a core asset and business differentiator. Let’s examine some specific areas that can be enhanced with an IoE solution: employee productivity, revenue, expenses and customer experience. Staffing: IoE allows facility managers to concentrate on value-driven actions like customer-service tasks and unit rentals. Integrating your keypad with an IoE platform also provides insight to who’s accessing the property and when. Consider reducing employee hours or using a kiosk during those low-traffic times. Flexibility: You control your facility from anywhere in the world. Data and decision-making: Open application program interfaces (APIs) allow property-management systems to integrate, providing data and information about facility operation. The analytics from IoE integration allows you to make better-informed business decisions, and having unprecedented insight to your property can help you increase occupancy and rental rates. Expenses: Connected solutions provide cost savings and are surprisingly more affordable than older technology. System maintenance: The intelligence gathered by an IoE platform allows you to predict and stay on top of functionality for security, HVAC and other systems. Software: You can now avoid the expense and lost time associated with manually performing software updates. Customer convenience: Offering hands-free access to storage units, “text me my code” features, and the ability to make rental payments via mobile apps and devices enhances the customer experience. Communication: Consider using customized messages on the facility keypad to welcome tenants to the facility or provide important information. Customers don’t visit often, so visual communication is an important part of creating an attractive experience. You can also ditch those old posters and signs and replace them with digital signage, populated with promos specific to your onsite customers. Self-storage has evolved into a retail service more than a real estate venture, and according to recent studies, 60 percent of retailers are pursuing IoE initiatives. The top reasons are better customer service and support. The sector is increasingly using beacon devices that use Bluetooth Low Energy—a wireless, personal area network—that can be incorporated with mobile applications. The beacons can provide directional information, messaging or even facility access to customers. Online retailers know when an item goes into a customer’s shopping cart but isn’t purchased. Advancements in IoE and beacon technology are starting to deliver this type of information to brick-and-mortar stores. In a self-storage setting, this enhancement could help you track walk-in conversions, available inventory, and the amount of time customers are spending in the office, waiting to be serviced. Drones can also be useful in an IoE platform. One company has recently introduced a system that can be combined with facility security. When it detects motion, vibration or an alarm, it can deploy a drone to the location and stream real-time video to your mobile phone. Drones can also be configured to perform visual patrols of your property. When incorporated with an IoE solution, this type of system could perform lock and facility checks, as well as provide security monitoring. Remember, there’s a shelf-life to technology. If you have technology that’s two to five years old, it most likely doesn’t have the security infrastructure to connect to the Internet and obtain the benefits of IoE. Using older tools is like putting lipstick on a pig; while it might look better, you’re not going to be able to take advantage of all the advancements. You could even be putting your data security at risk. Many people believe new technology has to be expensive, but case studies have shown that an IoE platform has a total cost of ownership that’s 40 percent less than older, PC-based technology. This doesn’t include the benefits of increased employee productivity, cost reduction or enhanced customer experience. An IoE platform creates many new opportunities for self-storage owners and operators. Now’s the time to investigate this new technology and the ways it can improve and enhance your operation. Jon Loftin is vice president and Internet of Everything (IoE) product owner for OpenTech Alliance Inc., a Phoenix-based provider of self-storage kiosks, call-center services and other technology. He has more than 25 years of hands-on experience in the storage industry, specializing in technology advancements, particularly for access control. For more information, call 800.481.7459; e-mail sales@opentechalliance.com; visit www.opentechalliance.com.